This page is part of the info pages on the gods of Mythology Island. It is not written by me (but some of it is edited by me.) Hades, God of the Dead and ruler of the underworld, was one of the most feared gods in all of Greek Mythology. In fact, the Greeks were so afraid of him that they refused to call him by name. Instead, most Greeks just referred to him as Pluto. He is the brother of Zeus and Poseidon and when they conquered the Titans, the three brothers divided the world between them. Hades must have gotten the smallest share. In Greek Mythology, the crown of Hades was very powerful. It was crafted by the Cyclopes, the powerful one-eyed creatures who were born to Gaia and Uranus. The crown was used by Perseus to help him defeat the Medusa. 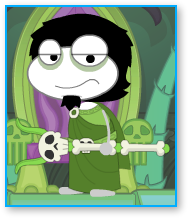 In Poptropica, you will need to put some pomegranates on Hades' altar. This is a reference to the legend of Persephone, who Hades kidnapped and brought to the underworld to be his wife. She was freed by Zeus, but before she left he gave her a pomegranate which she ate. This bound her to stay in the underworld for part of each year. The legend is that this is the winter-time and her absence from Earth is why nothing grows during the winter.